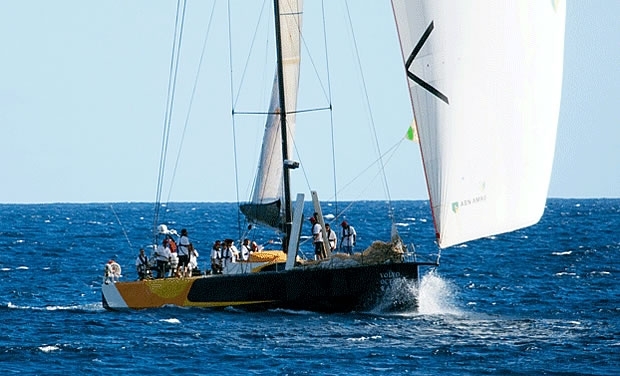 The Mount Gay team aboard the British VO70 Monster Project set a new absolute record in yesterday’s Mount Gay Barbados Race with a time of 4 hours 42 minutes 28 seconds, knocking 21 minutes off the previous record established in 2012 by John Wilson's Reichel Pugh 78 Idea. Idea, however, broke the CSA record for corrected time. Monster Project, with Loic Blanken on the helm, and Fabrice Cornic on tactics, sailed a smart, mistake-free race and, in ideal conditions the team was able to enjoy a spectacular sail round Barbados. Formerly Kosatka, the Team Russian entry in the 2009 Volvo Ocean Race, Monster Project is Mount Gay’s charter boat for this event, and it is hoped she’ll be back to defend her title next year. As Monster Project sailed into port, Andy Budgen, owner and crew boss, said he was delighted with his team’s performance and says one of the best things about their achievement is the prize. “We are very pleased and to be honest it is a bit of a surprise. We are particularly happy to be winning the skipper’s weight in rum – all 120gs of it. Father and son duo from the UK, Nick and Adam Munday, who won their trip to the Mount Gay Round Barbados Race Series, courtesy of the Barbados Tourist Authority London Office, for their overall win of the Royal Southern Yacht Club Summer Series champion of champions event in 2013 in their J/97, were fortunate enough to be onboard too. With winds reaching 25 knots on some parts of the course, and big rolling seas the 36 entries in the 60 mile Mount Gay Round Barbados Race ranging from a local windsurfer to a Dutch brigantine, Tres Hombres. The big attraction for the big yachts was the potential of breaking the outright record based on elapsed time. Realistically, there were two, possibly three yachts in with a chance of taking the record, including Idea defending the 5 hours, 3 minutes, 34 seconds record she set in 2012, Mount Gay Monster Project and Caro, Max Klink's new Botin Partners 65, which recently won the ARC. There were staggered starts with slowest boats setting off first (from 0730) and fastest boats last (1140) and the wind in the early part of the race remained fairly stable. However, a rain squall that swept through the fleet late morning was an advantage to some of the bigger boats that had just started. Interestingly the wind also made a fairly untypical shift round to the south rather than the forecast shift to the north, which made rounding the entire eastern side of the island beat. As time ticked by, the fleet made its way fairly rapidly round the island and the first boats appeared on the horizon on their final sprint to the finish mid-afternoon. Line honours were taken by solo sailor Peter Allen aboard his Spronk catamaran Stiletto, completing the course in 7 hour 53 minutes 55 seconds. Next to cross the line was Mount Gay Monster Project, with Cheeki Rafiki, Beneteau First 40 sailed by Doug Inniss and team in third, and Peter Lewis’ well sailed J/105 Whistler in fourth place across the line. At that stage of the race, with Idea still 20 minutes or so from the line, any hope of her successfully defending her title, diminished leaving Mount Gay Monster Project the new record holder.